Create a space to center yourself with vivid colors and nature-inspired details. Do you find yourself daydreaming and filled with wanderlust? Find the perfect pieces from near and far to make a haven in your dorm room. Paisley patterns and pops of worldly elements are exactly what you need. This collection highlights floral bedspreads, floral home accents, and all other pieces needed for a bright and welcoming home decor look. You can find all your floral home accessories at Designer Living with our Floral Home Decor Inspiration Collection. 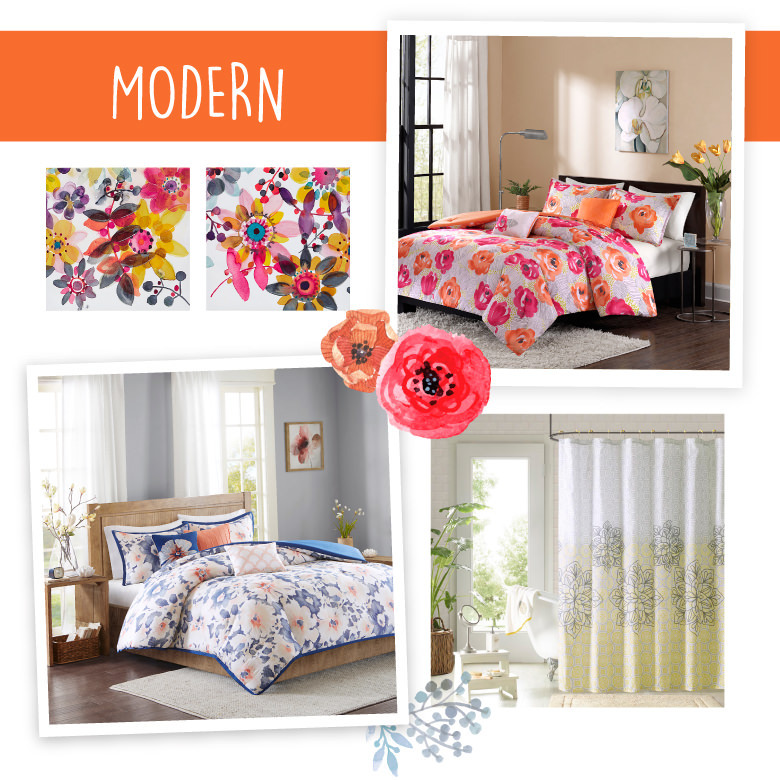 Shop our floral home accents below to create a cheerful and inviting space. 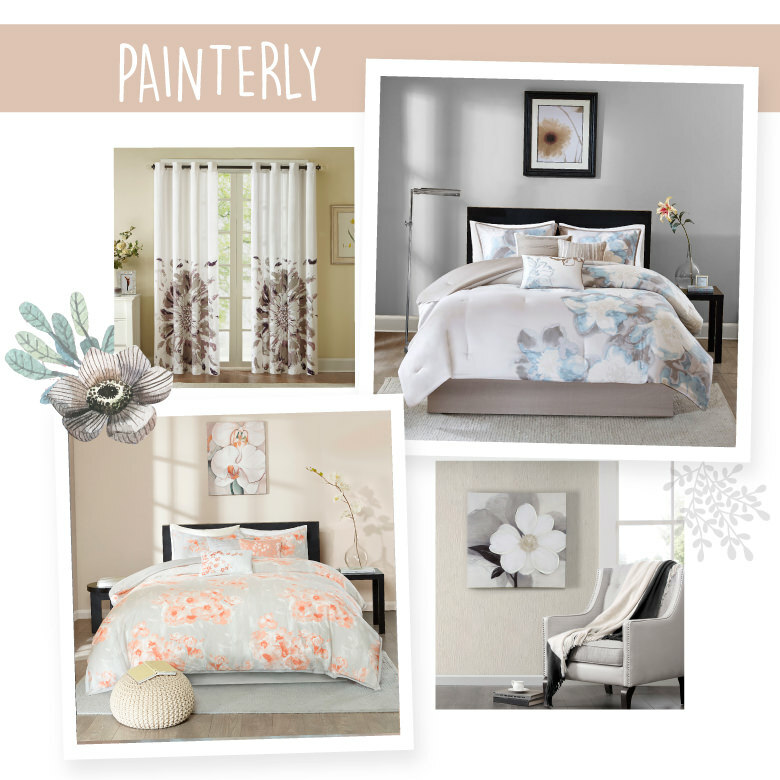 Soft color palettes and whimsical designs creates the Painterly Collection. These floral bedspreads and curtains showcase organic designs and pastel colored schemes to create a relaxing sanctuary right into your bedroom. These pieces evoke a sense of dreamy watercolors. Painterly styles show brushstrokes and are much softer feeling prints, yet still have vibrant colorways. If you want to create a feeling of serenity into your master bedroom, then this is the collection for you. Take this design even further by adding a modern accent chair in a neutral tone. The Whimsical Collection at Designer Living is both bright and sophisticated.These versatile rose floral bedspreads are timeless and vibrant, perfect for a timeless feel. 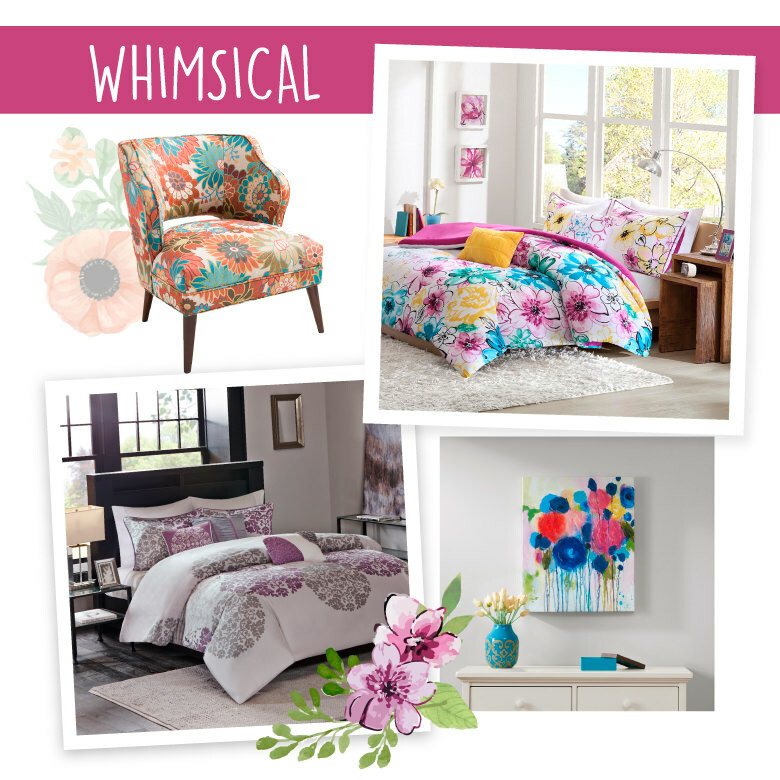 If you want a home decor look that truly reflects your bold personality, shop the Whimsical collection now. Whether you decide to make the focal point a floral bedspread or an accent chair, these organic pieces add a pop of color and personality in any room they are added to. These transitional styles are youthful and energetic. Bright splashes of color combined with oversized prints to create bold statements for your space. 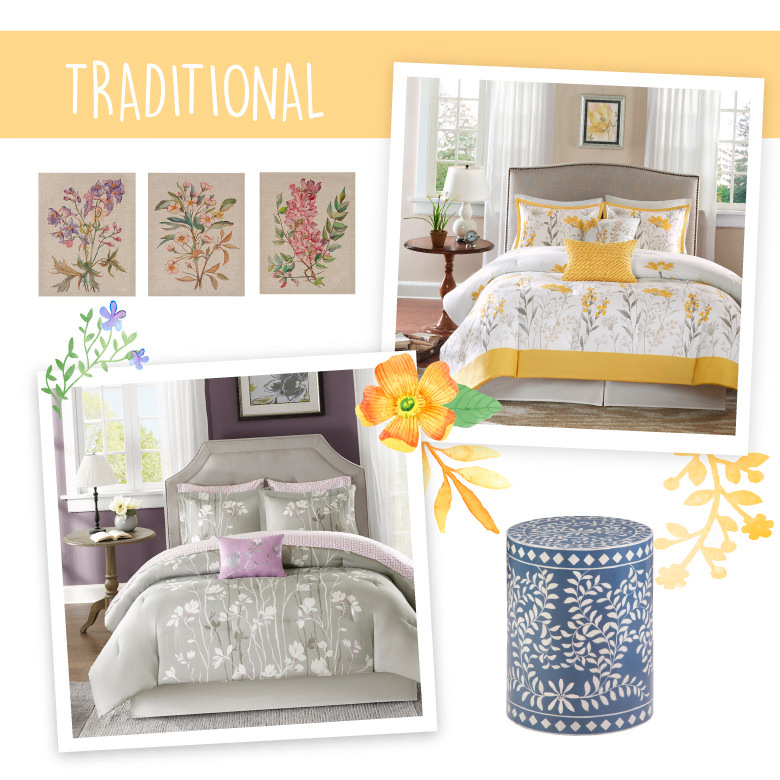 If you prefer a traditional style, you’ll still feel up-to-date with these patterns. Current color trends keep these pieces feeling like they were freshly cut from the garden! The Traditional Collection highlights timeless pieces that will always be in style. These bedspreads combine simple colors with delicate detailing to create a comfortable and natural atmosphere. To add a pop of color, try bringing in some floral throw pillows or a beautifully decorated ottoman. These pieces are versatile and practical, perfect for any home. For an on-trend look, we love the modern feel of these bright florals. With geometric, digitized or hand-drawn elements incorporated into the design they feel contemporary and new. The Modern Collection adds more than just a pop of color. This room completely transforms a space into a bright and charming oasis. These modern floral beddings are beautifully crafted to serve as the main focal point of any master bedroom. To complete this look, try bringing in simple window treatments that compliment the colors in the bedspread. For a stronger statement, go with floral bedding, accent furniture, or wall art. If you want to bring just a bit of the outdoors inside, use window or shower curtains, and decorative pillows to create a little splash in your space. No matter what kind of look you are going for, Designer Living has something for you. For more inspiration, check out our Bedroom Collections and Home Decor Inspiration Boards on our website today.